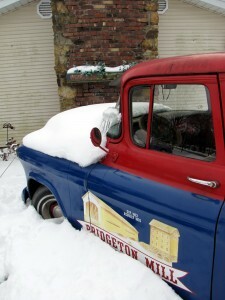 Time to dig out the Ole Mill Truck. Maple Syrup Fest. is coming. Feb. 27 – 28 and March 6 – 7. I like to deliver the mill products to the festival with the mill truck. Ethan (age 10 – grandson) is sick and spending the day with me at home. Hopefully, tomorrow he will be better and I can head out to the mill and get prepared for the festival. The mill might not be OPEN for the Fest. I will be in Rockville at the Pancake Breakfast. If Nate (Youngest son – 29) isn’t working he will OPEN up the mill. We usually do very well here cause a lot of folks are running out of our products.